Sydney attraction-guides.com - Sydney, Australia attractions guide Sydney Circular Quay attraction information, port, cruises, cafŽs, eateries, harbour views, water taxis, opening hours, location and address of Sydney Circular Quay, tel / telephone number, and general tourist information about Circular Quay in Sydney Area, New South Wales NSW, Australia, AU - Last updated 30/10/2012. 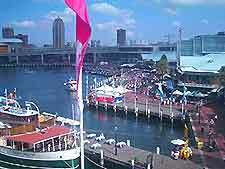 Sydney's central Circular Quay is a busy port and has now become a major tourist attraction in its own right. With cafés, eateries, breathtaking harbour views, water taxis and regular cruises, Circular Quay offers an exciting and friendly atmosphere.